The use of semi-submersibles to transport drugs from Colombia dates back to the early 1990s, when drug traffickers began to build rudimentary vessels in response to increased maritime patrols and radar tracking aimed at "go fast" speedboats. Semi-submersibles -- which sit just below the waterline, but have exhaust pipes above sea level -- are extremely difficult for law enforcement to detect. According to an investigative report by InSight Crime, an American crime monitoring website, that due to the great difficulty finding semi-submersibles once they are at sea, intelligence agencies typically concentrate their efforts on identifying the builders. In the early 1990s, as radar and communication technology held by military units and law enforcement agencies improved, small planes and go-fast boats belonging to the Colombian cartels became more easily detectable. As a result of the increased pressure from governments and policing authorities, drug smugglers had to design countermeasures and develop innovative ways to transport and deliver their drugs. Drug trafficking organizations have also started building fully-submersible submarines, the first of which was discovered in Ecuador in 2010. These can only be detected using sonar radar, which usually only warships are equipped with. Despite the efforts of several national and international law enforcement agencies to seize drugs, arrest smugglers, disrupt the operational capabilities of cartels, and diminish the flow of illicit drugs, drug smuggling continues. International law enforcement agencies and military units have increasingly collaborated and their efforts have yielded numerous littoral and ocean seizures and arrests. Nonetheless, drug smuggling activities in the Western hemisphere still persist. The fact that the semi-submersibles built by "El Ingeniero" departed from the Gulf of Uraba is unsurprising as this area is a popular departure point for drug shipments due to its strategic location on the Caribbean Coast near Panama. The area is also a stronghold for the Urabeños, who made their foray into the criminal underworld taxing contraband shipments leaving from the gulf. The organization has since become the most powerful of Colombia's criminal syndicates and a major player in the transnational drug trade. By 1990s, Colombia’s Medellin Cartel began to consider ‘narco-subs’ as covert and innovative method for distributing its products. Because the Colombian drug cartels at that time were vertically integrated— they controlled the various steps in the product value chain (coca cultivation, manufacturing, distribution, etc.,)—they well understood the economic value of being able to efficiently control the delivery of narcotics to their destination while lowering the risk of detection, interception, and apprehension. As a result, Colombian drug cartels began to allocate economic resources and invest in producing narco-submarines as an alternate distribution method. Actual Russian naval engineers were contracted by the cartels to assist in narco-submarines’ design and construction. The apparent goal of drug smugglers was to develop a vessel that would be self-propelled, radar-dodging, stealthy, and capable of travelling long distances. After the Med After the Medellin Cartel’s collapse in the early 1990s and subsequently the arrests of the Cali Cartel leaders, remaining lieutenants and their respective emerging drug smuggling organizations continued to make investments in narco-submarine technologies. The Tayrona Narco-Sub: In 1994, another vessel, named the Tayrona submarine was seized near Santa Marta, Colombia. This vessel was less than 10 meters long. It was made of wood and fiberglass and was fit for shallow submergence only with depth controlled by lead weights externally mounted on the lower hull. It also possessed advanced communication and navigation equipment. The Cartagena Narco-Sub: A year later, Colombian authorities captured an unfinished vessel in Cartagena, Colombia. This vessel, the Cartagena submarine, had a cylindrical steel hull which hints the intention of operating it at greater depths relative to the fiberglass vessels previously confiscated. When this vessel was found there were no ballast tanks nor the water inlets/outlets associated with them, which suggests that lead weights were to be employed similarly as with the 1994 Tayrona model. The 1995 Cartagena submarine was about 11 meters long, 2 meters wide, and had a carrying capacity of about 1.5 tons. As the years transpired, the narco-sub technology seems to have improved. As with any technology, iteration was probably necessary and results were not immediately evident. The Facatativa Narco-Sub: In September 2000, law enforcement agencies in Colombia found a Russiandesigned narco-sub in the town of Facatativa, near Bogotá. This vessel was longer and wider than previous models and had a more elaborate cylindrical, stealthy design. When the vessel was found it was still under construction. Its estimated construction cost is 10 million USD. The Facatativa submarine was 30 meters long and 3.5 meters wide. This vessel was indeed intended to be a submarine, capable of full submersion. It was to be ‘double hulled’ with a single shrouded screw. It is estimated that it could have carried a crew of up to12 persons. Had this submarine been completed, the double-hulled vessel may have been able to travel long distances 2,000 nautical miles (3,700 km), dived 330 feet (100 meters) and carried 150-200 tons of cocaine or heroin. The Facatativa vessel is significant as it had a large carrying capacity (storage space), and would have been able to travel long distances and dive to depths that would have made its detection highly challenging. The Facatativa model would likely have had depth sonar, satellite communication, GPS, and navigation radar. The Vigo Narco-Sub: Spanish Police in 2006 captured a vessel on the Atlantic coast which they called the Vigo vessel. It is believed that this submarine was constructed in Spain and was not closely related to the Colombian subs in design terms. The vessel was 11 meters long, 3 meters wide, and made from steel with ballast tanks on the flanks. A design feature worth noting is the use of separate props for the diesel (main) and electric drive. This vessel was likely intended to travel short distances between a cargo ship and shore to bring illicit drugs into Spain for distribution. A Kevlar Coated Narco-Sub: In July 2010, Colombian and Ecuadorian authorities with the assistance of the United States found and seized a submarine a few miles south of the border between Colombia and Ecuador. This was a noteworthy find as this was a 30 meter long, 3 meter wide, large fiberglass submarine with diesel-electric drive and twin screws. The Kevlar coated submarine was designed for underwater operation while it could also operate in shallow submergence. The pilot windows located at the base of the sail seem very similar to the cockpits of other low-profile vessels. The Timbiqui Narco-Sub: In February 2011, Colombian authorities assisted by the DEA (Drug Enforcement Administration) seized a 100 foot long (30 meters) submarine in Timbiqui, Cauca, Colombia. The submarine lied half-submerged in a mangrove swamp. The vessel was a fully submersible made out of fiberglass. It could carry a crew of 4 and dive down to 30 feet (9 meters) below the surface. The submarine had the capacity to transport 8 tons of narcotics worth close to $150 million to $200 million USD. The estimated cost of building this submarine is around $2 million USD. The vessel’s design, two diesel engines, and sophisticated navigational equipment would have allowed it to travel long distances (up to 2,000 miles) at a speed of up to 11 miles per hour. Since early 2006 there were an increased number of seized narco vessels, namely low profile vessels (LPVs). Improved detection and surveillance technology allowed authorities in Colombia and the United States to more easily detect, intercept, and seize drug carrying vessels. Authorities then realized that drug smugglers countered accordingly and produced increasingly sophisticated vessels, which include features such as modern electronics, navigation systems, anti-radar features, and water-cooled mufflers, all of which make detection more difficult. The first low profile vessels (LPVs) boats resembled sealed ‘go-faster’ boats which simply rode lower in the water. The usual arrangement of these vessels had a cabin at the rear and cargo hold amidships. However, over time the LPVs’ configuration has been modified resulting in a specialized hull form with generally pointed bow and stern, with small cabin amidships, an engine compartment located in the rear of the vessel, and narcotics cargo placed in every available space. Moreover, sloping sides to the cabin suggest radar stealth. Overall, the vessels’ stealthiness derives from being built largely out of fiberglass and being low in the water. In more recent model adaptations, LPVs included the capability to trim running depth via hydroplanes at rear, a much lower profile than most low-profile boats with the nose completely submerged even in calm seas, and metal construction instead of fiberglass. Some examples of LPVs include the 2006 Pital model and the 2007 Guajira model. The 2006 Pital LPV was seized on the River Timbo near Buenaventura, Colombia. It was 18 meters long and almost 4 meters wide. It could carry 4 tons. The 2006 Pital model is unique for its twin engine and twin prop arrangement. The 2007 Guajira LPV seized off Colombia’s Atlantic coast was 20 meters long and 3 meters wide. It had the capacity to carry 10 tons. The rounded cross-section of this LPV provides much larger internal volume and load capability than most other low-profile boats previously constructed. The mechanical design of this vessel is also of a twin engine with twin props. 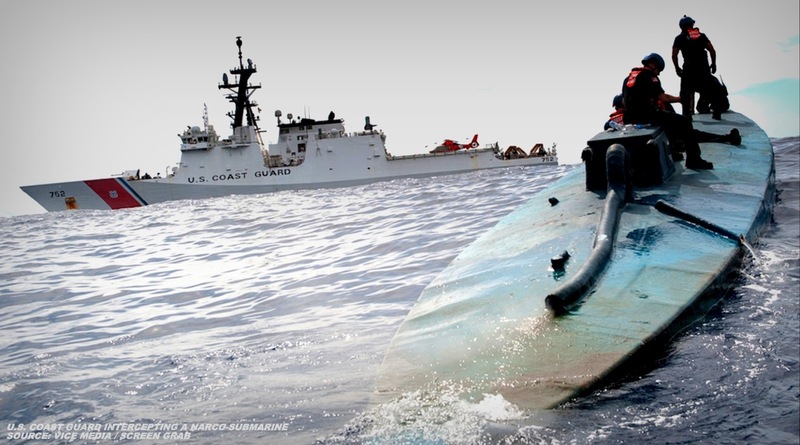 In August 2005, U.S. authorities seized an unmanned semi-submersible in the Pacific Ocean. This caught the attention of militaries and law enforcement authorities as they realized that some vessels were being built in the form of torpedoes, filled with narcotics, and towed underwater by another boat. The ‘narco torpedo’ essentially travels at a depth of about 20 to 30 meters. The torpedo is released if the authorities approach, and discharges beacons after a set period of time to allow recovery by a back-up boat after the authorities have left the area. The ‘narco-torpedo’ vessel represents a tactical variation in transporting narcotics. Narco-torpedoes are designed to be difficult to detect and are cheaper to build than semi-submersibles. During the past 20 years, drug smugglers have experimented with the design and construction of submarines, semi-submersible (SPSSs) vessels, low profile vessels (LPVs), and narco-torpedoes. The vessels that have been seized to date reflect technological innovation as well as a commitment towards continuously improving the vessels’ design and operational capabilities. Drug smugglers have effectively employed technology as means to their specific ends. It is evident that during the last two decades drug smugglers have invested on advancing their ‘narco-sub’ technologies. There is a clear economic payoff in doing so; the cost of building one of these vessels is low relative to the immense levels of profit they produce, while their design and engineering help to reduce the overall risk of detection. It is not known how many of these narco-sub vessels are currently under construction and in operation. However, we can be certain that in spite of increased efforts on the part of militaries and law enforcement authorities to detect, intercept, and disrupt narcotics distribution, drug smugglers will certainly continue to search for effective ways of transporting and delivering their product. 1. Jim Popkin, “Authorities in Awe of Drug Runners’ Jungle-Built, Kevlar-Coated Super-Subs.” Wired Magazine. 29 March 2011, http://www.wired.com/magazine/2011/03/ff_drugsub/all/. 2. Top Documentary Films staff, “Cocaine Submarines.” Top Documentary Films.com. 2010, http://topdocumentaryfilms.com/cocaine-submarines/. 3. Documentary.net staff, “Colombia’s Coke-Smuggling Submarines.” The Documentary Network. 11 July 2013, http://documentary.net/colmbias-coke-smuggling-submarines/. 4. Tobias Käufer, “Colombia’s Drug Submarines Becoming Vehicle of Choice for Cartels.” Huffington Post. 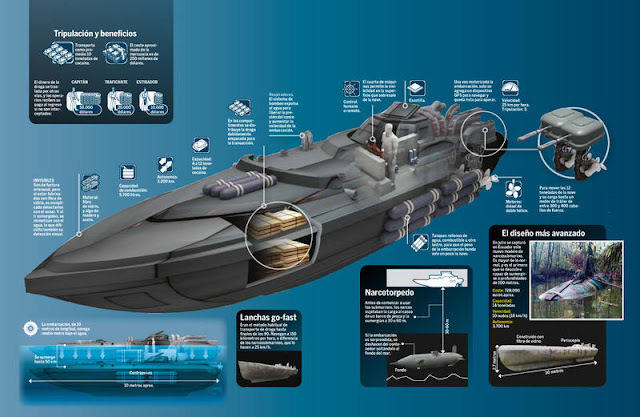 20 July 2011, http://www.huffingtonpost.com/2011/07/20/colombia-drug-submarines- _n_904780.html. 5. Vice staff, “Colombian Narcosubs.” Vice.com. 15 February 2011, http://www.vice.com/motherboard/colombian-narcosubs. 6. John Otis, “Drug Traffickers Move Underwater.” Global Post. 15 April 2009, http://www.globalpost.com/dispatch/the-americas/090408/drug-traffickers-move-underwater. 7. Christopher Lagan, “Drug Subs 2.0.” Coast Guard Compass. 13 July 2010, http://coastguard.dodlive.mil/2010/07/drug-subs-2-0/. 8. Chris Kraul, “Ecuador Police Seize 100-Foot Narco-Submarine Being Built Secretly.” Los Angeles Times. 6 July 2010, http://articles.latimes.com/2010/jul/06/world/la-fg-ecuador-narco-sub-20100706. 9. RT staff, “Feds Helpless in Fight with Drug Cartel Submarines.” RT.com. 11 September 2012, http://rt.com/usa/drug-us-submarines-guard-900/. 10. National Geographic Channel staff, “Inside: Cocaine Submarines.” Natgeotv.com. 2012, http://natgeotv.com/ca/inside-cocaine-submarines. 11. Dane Schiller, “'Narco Subs' Of Cartels Sink To New Lows in Trafficking.” Houston Chronicle. 26 June 2010, http://www.chron.com/news/nation-world/article/Narco-subs-of-cartels-sink-to-new-lowsin-1707377.php. 12. National Geographic Channel staff, “Cocaine Sub Hunt.” Natgeotv.com. 28 June 2011, http://www.youtube.com/watch?v=QLauqH1EeII. 13. Sibylla Brodzinsky, “Secret of the Swamps: Colombia's Cocaine Submarines.” The Guardian. 21 June 2009, http://www.theguardian.com/world/2009/jun/21/colombia-swamps-submarines-drugscocaine. 14. Jim Popkin, “The High Seas.” Slate Magazine. 8 October 2013, http://www.slate.com/articles/news_and_politics/foreigners/2013/10/mauner_mahecha_s_drug_submarines_inside_a_high_tech_south_american_narco.html . 15. Michael S. Schmidt and Thom Shanker, “To Smuggle More Drugs, Traffickers Go Under the Sea.” The New York Times. 9 September 2012 http://www.nytimes.com/2012/09/10/world/americas/drugsmugglers-pose-underwater-challenge-in-caribbean.html?_r=1&. This is an abridged report based upon Dr. Bryon Ramirez's original publication at Small Wars Journal under the title "Narco-Submarines: Applying Advanced Technologies to Drug Smuggling".